Ingrown hair is a condition where the hair curls back or grows sideways into the skin. The ingrown hair condition is seen primarily among people having curly hairs. It may or may not be accompanied by an infection of the hair follicle (folliculitis) or "razor bumps" (pseudofolliculitis barbae), which vary in size. While ingrown hair most commonly appears in areas where the skin is shaved or waxed (beard, legs, pubic region), it can appear anywhere (e.g. eyelashes ). Anything which causes the hair to be broken off short with a sharp tip can cause ingrown hair. Shaving is the leading cause, followed by waxing and tight clothing. The embedded hair causes a localized inflammation (sometimes painful) response in the skin with prostanoid involvement. Sometimes an ingrown hair occurs without external intervention, when the pore is blocked from various reasons, as is the case in keratosis pilaris, and the hair is forced to grow sideways. Symptoms include rash, itching skin, hair which remains in spite of shaving, and infection and pus collecting under skin. Treatments for ingrown hairs include putting a warm washcloth over the ingrown hair, shaving in a different direction, tweezing, exfoliating with facial scrubs, sponges, towels, or creams containing acids, and ibuprofen. 1. Multi-blade - Usually used with interchangeable, disposable blade cartridges, or the entire razor (including the handle) can be thrown away after use. b. Straight razor - These have fallen out of favor since the emergence of disposable razors and electric shavers because they require considerable skill to use. 2. Wash and exfoliate the area with warm water and soap immediately before shaving. This helps slough off dead skin cells, so that you don't end up using blades to move them aside when they could be focused solely on cutting hairs. The warm water softens the existing hair and encourages the pores to open, making for a closer shave. The warmth of the water also helps remove oils that may be harboring dead skins cells or other foreign matter than can clog pores or interfere with shaving. The soap eliminates bacteria, which is itching to get into your freshly shaven pores and cause irritation or even infection. 3. Apply some kind of lubricant. Shaving skin directly with a razor is a no-no. The razor should never contact your skin without some kind of lubricant mediating the encounter. Otherwise, the blade will drag the skin rather than skim along its surface. 4. Shave in the proper direction. Going against the grain (shaving the opposite direction that the hair grows) makes for the closest shave, but it also produces the most irritation. If you have a tendency to get bumps or rashes, or if you often get ingrown hairs, consider shaving with the grain instead. Whichever works best, try to make sure you only pass over an area once. Shaving the same area twice shouldn't be necessary if you're using a sharp implement and following these steps, but may be called for if your hair has gotten a little long and you need to trim it down to stubble by shaving with the grain before you shave against. It is also required when you're shaving your underarms because the hair there grows in various directions. If this is the case, remember to re-apply lubricant before shaving an area for the second time. a. Pull the skin taut. You don't have to actually stretch the skin, but if your skin is loose in any way, it helps to create a flat, firm surface for the razor to cut across. If you're shaving your underarms, for example, lift your arm as high as you can so that the skin under your arm is pulled tight. b. You should not need to press down or apply pressure with the razor. If this is necessary, then the razor is probably not sharp enough. A sharp razor will cut hair cleanly at its base level with the skin. 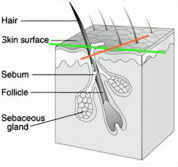 Pressing the blade down may cut the hair at a slightly lower spot, but it will also bring the blade in contact with the sensitive skin that surrounds the other side of the follicle. Applying pressure only makes it easier for a dull blade to tear the hair rather than cut it. Instead, guide your razor with minimal pressure against the skin. Keep the razor as flat to the skin as possible; so the sharp edge is not scraped against the skin more than necessary. 5. Pat dry and moisturize. Don't rub with a towel, as that can irritate the freshly shaved skin. Use a generous amount of moisturizer that is free of perfumes and other potential irritants (e.g. baby oil). Never apply deodorant, antiperspirants, perfume, or anything that stings on just shaved skin.